We found you again a Cancun vacation package that is hard to resist. Book your eco-friendly vacation at Now Jade Riviera Cancun for $778 until March 25 and save money! The price includes the flight from Fort Lauderdale with departure on April 20 and return on April 24. This Cancun vacation package might be sold out soon, so if it is no longer available or you want to be sure that you get the best price at the moment, please search between the offers of our partners in the box below. 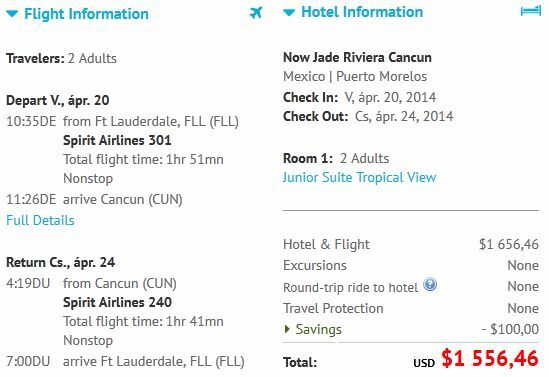 The eco-friendly Cancun vacation at Now Jade Riviera costs $1556.45 for 2 people. The deal includes two round trip tickets from the Fort Lauderdale-Hollywood International Airport (FLL) to the Cancun International Airport (CUN) and 4 nights in a luxury hotel. Please see the details of this Cancun vacation package in the screenshot below. The luxurious and stylish Now Jade Riviera is located in the Riviera Maya and only minutes away from Poerto Morelos. The hotel has 8 restaurants, 6 bars/lounges, watersports center, Aerobics facilities, Fitness/exercise room, Spa, Beauty center, Jacuzzi, offers family-friendly activities, Kids Club, babysitting/child care, free parking, Wi-Fi surcharge, different swimming pools, great food and great rooms. The price of $778.11 pp includes a Junior Suite Tropical View with 1 king bed or 2 double beds with a maximum occupancy of 3 adults and 1 child or 2 adults and 2 children. The air-conditioned room has balcony or patior, sofa bed, bathtub/shower combo, Jacuzzi Tub, bathrobe and slippers, ceiling fan, flat screen TV, safe, coffee maker and many others. This entry was posted on Sunday, March 23rd, 2014 at 2:54 am and is filed under Vacation Package Deals. You can follow any responses to this entry through the RSS 2.0 feed. You can leave a response, or trackback from your own site.